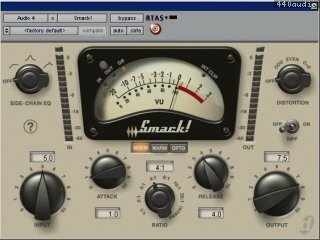 Digidesign Smack is a new professional compressor/limiter plug-in designed specifically for music applications, but capable of accommodating virtually any kind of audio material with equal success. Smack! features three compression modes, unique compression ratios, and harmonic distortion ideally suited for achieving a wide range of sonic variations and colorations. Additionally, the plug-in supports side-chain processing, multi-channel track types, and the full range of ProTools sample rates. Smack LE supports only RTAS and Audiosuite formats. Fixed: Smack! RTAS and TDM instantiations have linked controls (Item #57141) : In certain configurations Smack! RTAS and TDM instances could have controls linked.